Предзаказ на Амазоне. Выход - 6 ноября. Captain Ivan Vorpatril is happy with his relatively uneventful bachelor’s life of a staff officer to a Barrayaran admiral. Ivan, cousin to Imperial troubleshooter Miles Vorkosigan, is not far down the hereditary list for the emperorship. Thankfully, new heirs have directed that headache elsewhere, leaving Ivan to enjoy his life on Komarr, far from the Byzantine court politics of his home system. But when an old friend in Barrayaran intelligence asks Ivan to protect an attractive young woman who may be on the hit list of a criminal syndicate, Ivan’s chivalrous nature takes over. It seems danger and adventure have once more found Captain Vorpatril. Tej Arqua and her half-sister and servant Rish are fleeing the violent overthrow of their clan on free-for-all planet Jackson’s Whole. Now it seems Tej may possess a hidden secret of which even she may not be aware. It’s a secret that could corrupt the heart of a highly regarded Barayarran family and provide the final advantage for the thugs who seek to overthrow Tej’s homeworld. 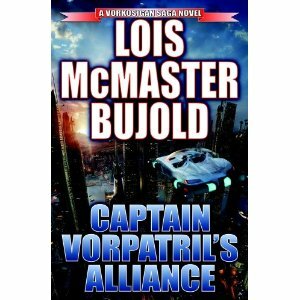 But none of Tej’s formidable adversaries have counted on Ivan Vorpatril. For behind Ivan’s faÇade of wry and self-effacing humor lies a true and cunning protector who will never leave a distressed lady in the lurch–up to and including making the ultimate sacrifice to keep her from harm: the treasured and hard-won freedom from his own fate as a scion of Barrayar.